Martin Chuck, a renowned golf coach and owner and director at Tour Striker Golf Academy at The Raven Golf Club in Phoenix, Arizona has teamed up with Boyne Golf for a Revolution Golf school experience at Boyne Highlands Resort in Harbor Springs, Michigan this summer. Chuck is an expert with Revolution Golf, which is a golf platform associated with the Arnold Palmer and Joe Gibbs co-founded Golf Channel and NBC Sports Group. Boyne Highlands plans to host Chuck and his team June 9 through June 12 and golfers who book the 2019 Golf School will receive personal instruction from Chuck and his two best assistants, while enjoying a three-night summer stay in northern Michigan. The Revolution Golf School, which is in high demand and sell out quickly, starts at around $2,595 for instruction and accommodations at Boyne Highlands. With a welcome reception on the Slopeside patio on Sunday, June 9th to tee-up the agenda, those participating in the Golf School have a chance for complete swing analysis using video, Trackman, and Swing Catalyst; instruction on the range and on the course for situational learning; long game, short, game, and hitting trouble shots such as rough and sand; practicing tips with a purpose and a personal practice plan; a 30-day follow-up by email or phone; and nine holes of golf, three breakfasts, two lunches, and two full days of instruction, followed by a graduation happy hour with the coaches. 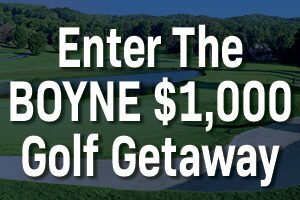 Non-students will also receive a $50 gift card to use at the property; and for those interested in extending their stay at Boyne Highlands to explore some of the other non-golfing activities such as spas, horseback riding, and winery tours, or schedule additional tee-times, the resort is offering an extending rate and able to help coordinate.